I’ve heard that when life hands you lemons, you should make lemonade. So I did. Gorgeous strawberry lemonade!! Because my refrigerator has a strange quirk. Whatever is shoved into the upper right hand corner of the top shelf freezes. Weird, huh? This time it was a package of fresh strawberries intended for an absolutely gorgeous dessert requiring perfect fresh strawberries. Frozen crystals and subdued colors were not going to help the gorgeous factor (which in actuality, may or may not, have been marginal anyway! 🙂 ) So strawberry lemonade it was. I pulled out the Splenda for this one to reduce carbs and calories. I barely brought the syrup to a light boil and stirred just until the Splenda dissolved, which it did very easily. Blending time with the frozen strawberries was quick. The strawberries weren’t thoroughly pureed when they started to glomp together, but adding about half the lemon juice at that point made it possible to quickly finish the puree. Add the remaining lemon juice for the last little burst of blender time. I used the one fresh lemon I had on hand, which yielded about ¼ cup of juice. I had zested the peel earlier for another recipe and still was able to squeeze lemon juice from the fruit — just in case you ever wondered if that would work. The rest of the lemon juice was bottled. Stir all together in a large pitcher for a wonderful not-sweet, not tart drink. Add ice as you like. A glass of this gorgeous drink invites lingering and laughter, relaxation and renewal. Perfect drink for summer entertaining or totally pampering yourself. Don’t wait for a quirky refrigerator to prompt you on this one! Strawberry Lemonade is a not-sweet, not tart drink invites lingering and laughter, full of healthy strawberry and lemon goodness. Bring sugar and water to a simmer in a small pan. Stir until sugar melts completely Remove from heat and let cool. Place strawberries in a blender and process until smooth. Add lemon juice to blender and mix with 5 second burst. 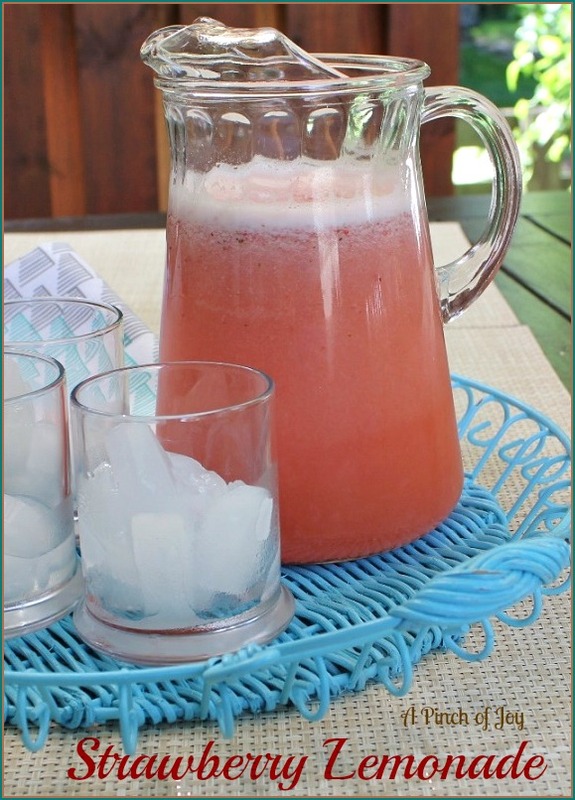 Combine strawberry lemon mix, sugar syrup and cold water in a large pitcher. Stir well. Add ice, as desired. What a refreshing looking drink. And for no fuss! It’s been hot here lately (miracle!) so I think I will try this over the coming weekend. Yum! That looks so delicious – I had to pin it! Glad you stopped by and thanks for the pin!! !